The first place we went to was the Widewaters pull-off area along Front Street. Note, don’t miss that turn off or you will be backtracking for what seems like forever. 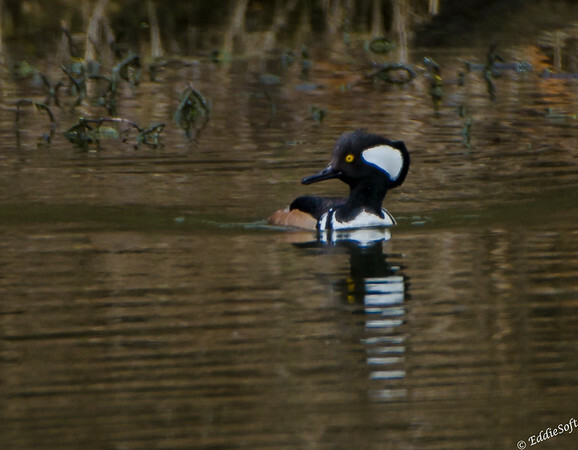 As soon as we stopped, we spotted a Hooded Merganser slowly paddling in the water straight out from the truck. I didn’t want to believe it at first because this particular bird has been on my top ten list for multiple years. I’ve see web posting on sightings all the time – began to think it was just a cruel joke and the bird didn’t actually exist. What was staring at me certainly had the signature markings of this nemesis duck – problem was it was too close. As soon as we stepped out of the truck, Mr. Hoodie became anxious and started paddling away. By the time I got The Beast on target it was drifting into dark waters thanks to a heavy tree line at the bank and the gray sky overhead (yes, another cold damp April weekend). Guessing we were being thwarted by heavy heat thermals coming off the water because neither Ron or I could get our Nikons to focus properly. All our shots were coming out soft even when pushing the manual settings to try and compensate for the grey environment. About 5 shots is all I could tin before the Hoodie took off for more private waters at the other end of the pond. A quick walk towards that area proved fruitless beyond the heavy gathering of Shovelers, a couple of Ring-Necks and a few Gadwells hanging out at that end. The drab coloring on those last two species making for difficult shots with the dreary day. We ended up driving further up the road to see if that happened to hold better spoils. Nope! Lucked out again on our way back. Another Hooded Merganser couple were spotted directly across the road where we spotted the other one. Much like the first one, our presence was met with some concern and they slowly started paddling further away from the shore. At least I was able to get a few shots of the female to go along with the male. This particular male went a little heavy on the hair gel that morning keeping that distinctive crest slicked back. The female did have her’s puffed up – definitely not as colorful. 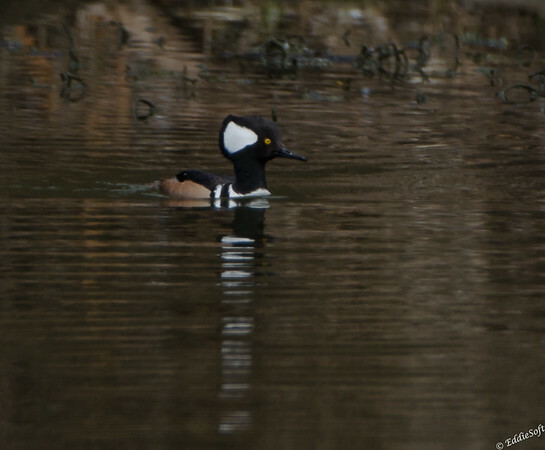 After racking up a pretty good count on the shutter, we headed off to the Four Rivers Environment Education Center in Channahon, IL There we spotted our THIRD sighting of Hooded Mergansers that day. Clearly someone was making up for denying us the Ross – ha. This couple was hanging out a good distance from the river bank. Didn’t really think there would be any worthwhile shots – if it was a struggle to get decent shots in the tin when they were closer, doubling that distance in choppy water wasn’t going to go well either. For the most part that was an accurate assessment at least for the floating shots. The female eventually decided the mall was closing soon and high tailed it down the river with the male close behind. That brought them on nearer trajectory allowing for a quick burst of final shots. Since this is a new bird to the blog, how about we take a quick look for some interesting facts to share. Ugh, turns out these uniquely feathered ducks practice brood parasitism – the act of laying their eggs in the nest of others. Just like those damn Cowbirds who are on my top ten disliked birds for the very same reason. Wow, did not know Wood Ducks do the very same thing – bad ducks, veerrrry badddddd ducks. Unlike the Cowbirds, the Hoodies lay their eggs in the nests of other Hoodies so at least the victims don’t need to spend the rest of their marriage trying to explain why their offspring look like the UPS man. Another new tidbit is the Hoodie actually hunt underwater by sight. They have the ability to use eye refraction to improve their vision under the water and possess a nictitating membrane – a transparent extra eyelid that acts as a pair of water goggles. Like the Hoodies above, time to make my exit. Hope you enjoyed reading about my latest addition to the birding checklist. Wait, I just remembered another theme from last post – this was another bird that Ron had and I didn’t hehehehe. Pretty bird! 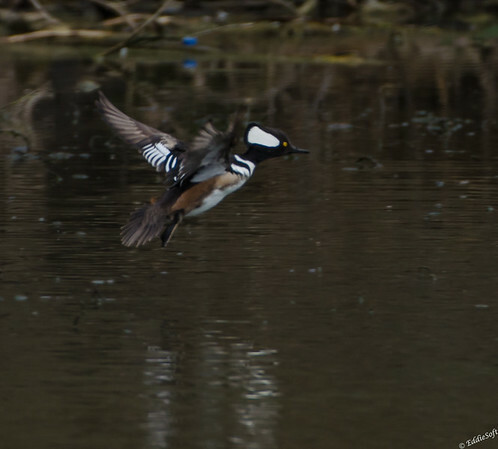 Again, your shots of the Hooded Mergansers are a lot better than mine from that day. That was a very dark, gray day (and cold!). My shots are all grainy. I could not believe the Ross’s Goose was not at the park in Wilmington when we got there. It’s been there for over a year and a half, and the last time I took pictures of it was just 4 weekends earlier. I felt bad about you driving 2 hours each way after all my coaxing about this, so I was glad you got a new bird out of the trip, anyway. And it wasn’t “we” that saw the Hooded Merganser as soon as we stopped, it was you who said right off, “What’s that bird?” It took me a while to pick that duck out of the Northern Shovelers, Gadwalls, Coots, Pied-Billed Grebes and Wood Ducks in the pond, but you picked it out immediately even though it was way in the back. Eagle eyes! yeah, it was not the best of conditions for sure – was thinking your auto-ISO mode would save you that day, but guessing that drove your ISO through the roof trying to compensate for the grey – I was trying to keep the ISO somewhat under control at the cost of lower than ideal shutter speed hoping the VR would take out some of it – probably better than I should have expected, but bummed it was such a struggle with a new bird in the mix. The Ross probably got wind of the possibility of being driven down to Peoria and promptly got the hell out of the there. Geese are notorious for not understanding jokes or sarcasm. I think I just got to point quicker than you thanks to discarding the Shovelers and ugh Coots instantly – seen enough of those in my lifetime. At first I thought it might be a Bufflehead, but beyond the white patch, the coloring wasn’t right prompting my question to you – been thinking ever since whether I should have waited longer to get out of the truck and maybe it wouldn’t have taken flight so quick. Although, think you agree, the waterfowl that day was extremely skittish – they would start heading out to deeper waters the second they saw either one of us. Thanks for the added detail! Next Next post: Uhhh What?